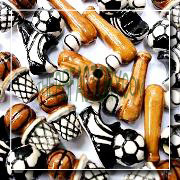 All you sport fans out there… Do you wish to wear your favorite sport theme beads and cheer your team up to win the match? Well, we have just the right product for you- Sport shaped beads that are simply adorable and crafted with the best materials by professional hands. “The Peruvian Bead Factory” is your only answer when it comes to cheering your favorite sport team in the most unique manner. 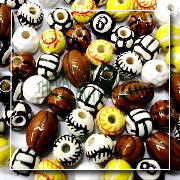 Our online services are incomparable and we own an excellent range of the exceptional Peruvian Beads & Pendants. 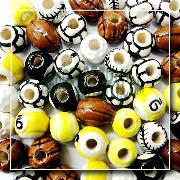 The sport shaped beads are available in various sizes. The Sport Beads are completely hand painted. They are perfect to give your jewelry and accessories a unique look with your favorite sport theme. Simply choose the best sport theme you require from our extensive collection and give your favorite team the best support! You can combine with your favorite alphabet by writing a support cheering phrase to add more glory to your creation! You can choose from different sports such as: Soccer / Football, Baseball, Basketball, Tennis, Softball, Golf, Tennis and more. 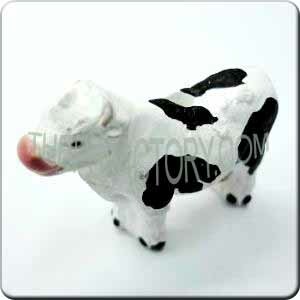 And pay attention because we are constantly adding more models in different sizes and even more sport types. 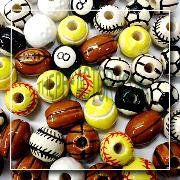 We also own a sub-category called ‘Special sport shaped beads’ that works amazingly in giving your sport theme a completely new level, be sure to check this sub-category.